Are you interested in finding a Loft Group or are you already attending one? Don’t miss the FREE Taco Bar “meet n greet” lunch where you’ll hear what community life is all about, meet the group leaders, and reconnect with friends! (Childcare provided.) This is a time to hop around lunch tables and “try on” some groups for fit. At The Loft, we don’t want to be just “Sunday friends”. We strive to truly be integrated into each others’ lives throughout the week. At the center of The Loft’s theology is a belief that spiritual growth and transformation happens when our community is in conversation. This is started on Sunday mornings, but taken to deeper levels in our groups throughout the week. 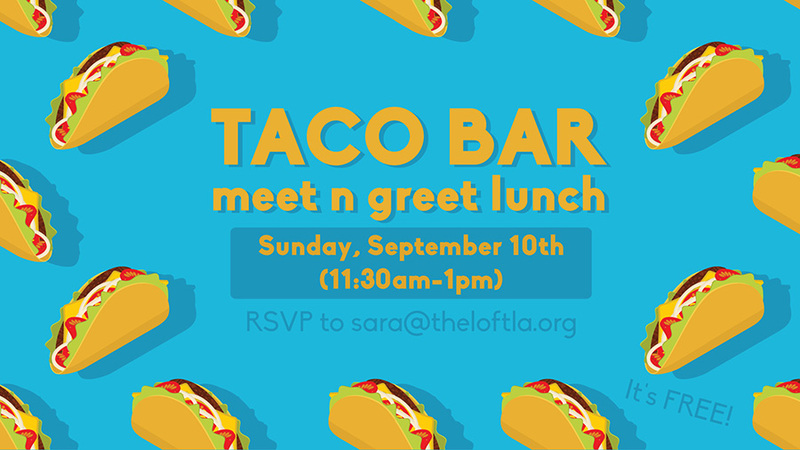 RSVP to Sara Critchfield, Director of Community Life, at sara@theloftla.org.